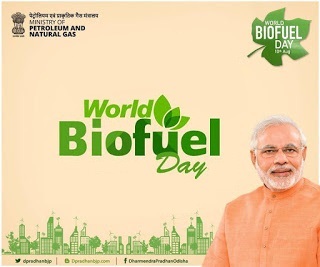 Today (10th August) is World Biofuel Day. This day is observed every year on 10th August to create awareness about the importance of non-fossil fuels as an alternative to conventional fossil fuels and to highlight the various efforts made by the Government in the biofuel sector. The major interventions include administrative price mechanism for ethanol, simplifying the procurement procedures of OMCs, amending the provisions of Industries (Development & Regulation) Act, 1951 and enabling lignocellulosic route for ethanol procurement. Important Note : The Government approved the National Policy on Biofuels-2018 in June 2018. Objective of National Policy on Bio-fuels 2018 : Reaching 20% ethanol-blending and 5% biodiesel-blending by the year 2030. China and India rank 120th and 177th respectively. India and Myanmar executed the landmark Land Border Crossing Agreement. Under this agreement check points on both sides are included as part of the pact. The opening of the check posts will facilitate travel on both sides as people holding passports and a valid visa will be allowed to exit and enter through these border check posts. Santali has become the 1st Indian tribal language to get a Wikipedia edition in its own script after the Santali Wikipedia went live today. Note : Santali is written in Ol Chiki script and spoken by 6.4 million people in India. Cabinet Committee on Economic Affairs approved the continuation of Pradhan Mantri Gram Sadak Yojana (PMGSY) beyond the 12th five year plan period. The target of connecting 1,78,184 eligible habitations under PMGSY was expected to be completed by March 2019. Almost 95% of these habitations had been sanctioned road connectivity and 91% habitations had been connected, the statement added. The Ministry of HRD has embarked on a major and new initiative Project called 'Study Webs of Active Learning for Young Aspiring Minds' (SWAYAM), which will provide one integrated platform and portal for online courses. Objective of SWAYAM : To ensure that the every student in India has access to the best quality higher education at the affordable cost. Japanese humanoid roboticist Hiroshi Ishiguro has unveiled an android robot called 'Ibuki' which is modelled on a 10-year-old child. The robot has complete vision routes that can scan for faces and 'involuntary' motions like blinking and head bobs. The Union Cabinet chaired by Prime Minister Narendra Modi today approved the signing the Memorandum of Understanding (MoU) between India and Indonesia on Health Cooperation and Scientific and Technological Cooperation. As per consolidated FDI Policy, 2017, the Government has allowed Foreign Direct Investment (FDI) up to 100% under automatic route in the Educational institutions subject to applicable laws/sectoral rules/regulations/ security conditions. The Serious Fraud Investigation Office (SFIO) today arrested Neeraj Singal, Managing Director of Bhushan Steel, for allegedly siphoning bank loans of over ₹2,000 crore. The investigating team found that erstwhile promoters used "complex, fraudulent manoeuvres" to divert funds raised from state-run banks using associate companies. Note : Tata Steel acquired Bhushan Steel after insolvency resolution. The Cabinet today decided to offer pulses to states at a discount of ₹15 per kilogram over prevailing wholesale prices for schemes such as PDS (Public Distribution System) and mid-day meal. The government will provide 3.5 million tonnes of tur, chana, masoor, moong and urad as it tries to dispose of surplus output. It will spend ₹5,237 crore for implementing this scheme. Policy think tank of the Government of India, NITI Aayog is hosting an Investors’ Conference today at Pravasi Bharatiya Kendra for the Holistic Development of Islands. The Conference was inaugurated by Amitabh Kant, CEO, NITI Aayog. Public sector non-life insurance company United India Insurance Company Ltd (UIIC) has appointed S Gopakumar as its Director and General Manager with immediate effect. The government today reappointed Ram Sewak Sharma as the Chairman of telecom regulator TRAI (Telecom Regulatory Authority of India). He will be in the position for 2 more years (till September 2020) when he turns 65. Neeraj Chopra, the 1st-ever Indian to win Gold Medal in javelin throw at Commonwealth Games, has been chosen as India's flag-bearer at the opening ceremony of the 18th Asian Games 2018.